It’s been almost a year since Spectrim was launched in the market and in that time we’ve seen real success from our customers who have invested in the platform. Spectrim’s ability to “grade above the line” is where the operator and packhouse are seeing business value. What is the line? The line is the grade which the packhouse is looking to reach. This grade could be the minimum USDA standard required for packhouses, or it can be the grade their customer's demand – the standard in which their brand promises and their consumers expect. Before Spectrim, packhouses used grading machines to get as close to the line as possible, but these still required the use of manual sorting processes to reach the line to which they wanted to operate. Having the ability to grade above the line with Spectrim is creating an enormous amount of value for packhouses, not only by affecting the profitability, but also by protecting the packhouse reputation by delivering exact fruit specs to their customers. - Read 10 reasons why your packhouse should be defect sorting. Reliable labor is getting harder to find and more expensive. The ability to remove manual sorters allows packhouses to reduce costs and increase throughput. Reliance on manual labor allows natural human error to effect the consistency and quality of packs. For example, when Lots of fruit arrive with a heavy defect population, it’s common practice to slow the line so manual sorting can keep the fruit in grade effectively avoiding bottlenecks in production. With Spectrim, you run the line at capacity, even when the defects are heavy. The platform’s ability to consistently and accurately grade above the line offers peace of mind for the operator. We boost their confidence to be prepared for whatever comes in from the orchard. With Spectrim, you also don’t have to account for keeping excess staff on hand to meet the requirements of heavily defected fruit that can change from Lot to Lot. This means the need for excess training can be reduced. Spectrim customers are receiving tremendous financial benefits from this combination of reduced labor, more consistent packout and increased throughput, which ultimately reduces their cost-per-pack. We have been told that reductions to direct labor are in the order of magnitude of 5%. 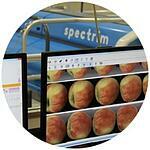 The Spectrim platform enables you to run your sizer at the speeds it is designed for with no risk of bottlenecking. Spectrim gives not only the operator, but the entire packhouse confidence in the quality they are packing and that they will meet customer’s exact specifications easily and consistently. Spectrim software can grade to exact specifications, meaning quality and consistency is ensured for the customer, grower returns are maximized and packhouses can rest easy knowing their brand value is protected. Spectrim’s unrivaled performance is extraordinary, and has raised questions if Spectrim is easy to use. With machine learning, the answer is a resounding yes. Additionally, Intelligent features such as SmartSkin and SmartMap allow the operator to get the most out of the platform. SmartSkin's machine learning algorithms identify good and bad skin via a simple click and drag interface, and SmartMap helps operators create sophisticated pack grades with ease by combining both defect classification and machine learning functions. Many packhouses are calling for increased visibility of data. Spectrim, along with Inspectra and Sizer are capturing this data and combining it with other data throughout the packhouse, helping to create some real business value throughout the suply chain. Read our blog on the value of data in the fresh produce industry for more information. Compac is working with packhouses to help provide information about each individual piece of fruit from the growers to the customer. This data is being used to make real-time and long term decisions about their business, rather than having to rely on gut feeling.